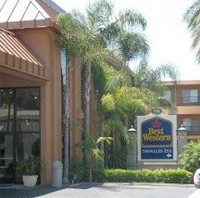 This hotel features 290 guest rooms with coffee/tea maker, hairdryer, iron and ironing board. Amenities include complimentary European Continental breakfast daily, two swimming pools, two whirlpools, kiddie pool, gift shop and adjacent restaurant. Complimentary European Continental Breakfast daily (pastries, cereal, fruit, juice, coffee, tea).